Congratulations to Boyne Community School Trim, Co Meath who are the winners of our schools competition ‘Win a Training Session With Kieran ‘Star’ Donaghy’. A HUGE thank you to all who took part. Fancy winning a coaching session with Kerry GAA legend Kieran ‘Star’ Donaghy? 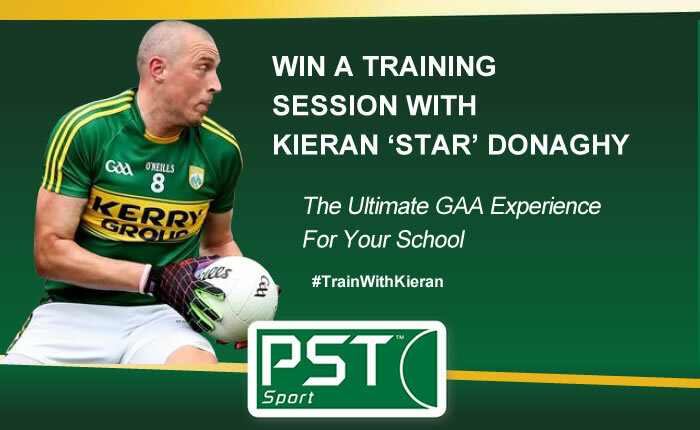 PST Sport is giving your school the opportunity to win a training session with Kieran. The competition is open to schools, both primary and secondary, all around the country and is part of PST Sport’s ongoing commitment to encouraging kids to keep active and supporting sport at a grass roots level. At PST Sport we’re all about keeping kids active and supporting sport at a local level. As part of our long term goal of improving sports development we are giving your school the opportunity to win a coaching session with ‘Star’. Kieran will visit your school offering personal advice and coaching as he oversees training activities. Kieran will put you through your paces focusing on different areas of skills. He will cover everything from warm up routines to drills that will focus on the basic skills of catching, kicking, shooting and lots more. Kieran will do his best to answer any questions you may have and give you some tips on how he and the team prepare for big games. To be in with a chance of winning all you have to do is tell us why your school should win this exclusive prize. Either complete the short form below or you can email info@PSTsport.com. The closing date for entries is Friday the 30th of March 2018 and the lucky winner will be announced on Monday the 9th of April 2018.